Last week’s home varsity football game brought more than the BBHCSD’s routine and loyal Bees’ supporters to watch the action on the gridiron. Officially known as Elementary Night, students in Grades PreK through 5 attended along with their families to root on their high school student counterparts. In advance of the game, members from the varsity football team, cheerleading squad and marching band visited Chippewa, Highland and Hilton Elementary School along with Central School to pump up elementary students, throw some football passes, perform cheer routines and get things shaking with spirited music performed by the band. In between the upperclassmen’s respective visits to the elementary schools at the end of the school day, and tonight’s kick-off, families joined in the parking lot for friendly camaraderie and tailgate fun. 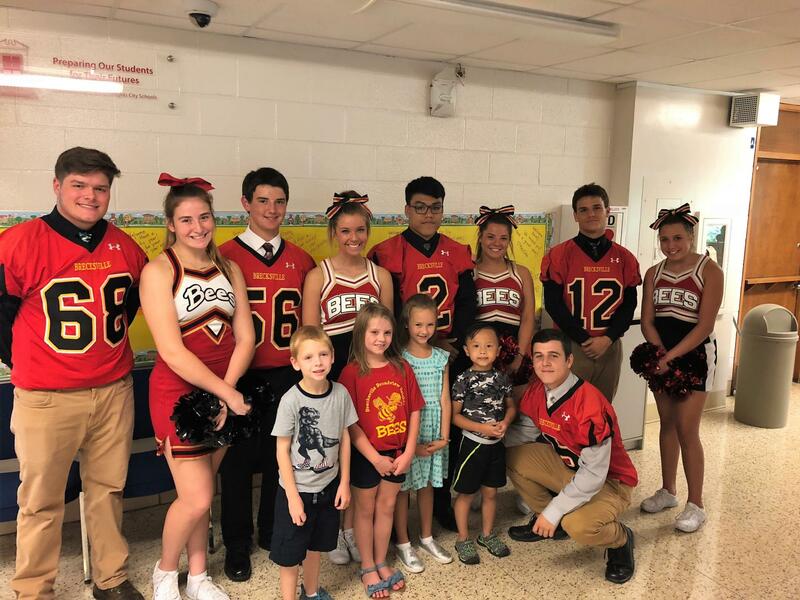 A special thanks goes out to the members of the football team, cheerleading squad and marching band for visiting with the younger students today and showing them with Bee Pride is all about. Thank you for your continued support of the BBHCSD!